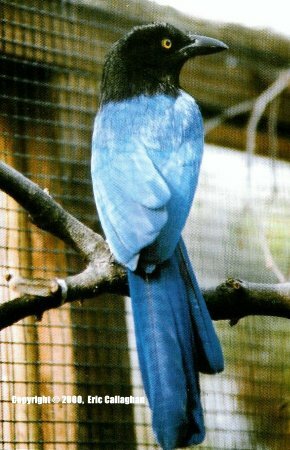 The BreedingSan Blas Jay Cissilopha sanblasiana is widespread along the Pacific coast of northern Mexico, where it occurs in lowland open wooded areas. It measures 27cm-3lcm (approx. 10in - l2in) long, the male being slightly larger than the female. The head, upper mantle and underparts are black. The upperparts, including the wings and tail, are blue, which is especially bright when seen in sunshine. The tail is relatively long and graduated at the tip. The legs and feet are yellowish and the bill is black. The iris of the eye is yellow. This is a social species in the wild living in groups of up to 30 birds and occupying extensive foraging territories. The group may include up to 10 breeding pairs, each of which may half-heartedly defend a small breeding area against other flock members. The pair bond in strong and may be lifelong and, while most birds do not breed until three years old, some first- year birds have been known to do so. Normally each nest is attended by a group of about six birds (Goodwin, 1986; Madge and Burn, 1999). I received a trio, consisting of two males and a female, on March 1st 1998. They had been kept together for more than six years. The size difference between the sexes was obvious and had been confirmed by surgical sexing. Moreover, at the time, the female's tail feathers were broken and were about half their normal length, making instant identification even easier. I was told that they had had eggs in the past, but nothing had come of these. It was obvious that there was a pair bond between the female and one of the males, the second male being subordinate. As this species is a cooperative breeder in the wild and there was no history of aggression between the birds, I decided to leave the three together. On arrival they were released into an aviary approximately 17ft long x 5ft wide x 7ft high (approx. 5.2m long x 1.6m wide x 2.2m high). They were very calm, allowing me to approach until there was just the wire separating us. The back and one side of this aviary are solid and the other side adjoins another aviary, with double wire between the two. Three potential nesting platforms had been installed, these being wire platforms approximately 14in (36cm) square, with some twigs wired to them to provide an anchor for any nesting material. One platform was located at each end and one about half-way along the aviary, all situated at the back. Clear perspex sheeting was attached to the outside of the aviary above each nest site. The aviary was planted with a couple of small shrubs and the floor was covered with bark chippings. It has been difficult to grow plants in the aviary as they tend to destroy most growing plants eventually. A dry dogfood, soaked in warm water, forms the basis of the birds' diet. In addition to this they received, from time to time, pieces of chicken wing, pieces of laboratory mice and raw minced beef. Small cubes of Cheddar cheese are also very popular. They readily accept chopped pear, tomato, kiwi fruit and banana and once each week half an apple, half an orange and half a pomegranate (when available) are placed on spikes in the aviary. The jays also accept peanuts in the shell and sunflower seeds, both of which provide a degree of entertainment as well as being a part of their diet. Mealworms are thrown into the aviary a couple of times a week and are searched for among the vegetation. During the breeding season the protein level in the diet is increased by using a high protein dogfood and increasing the amount of meat. During the winter, greater amounts of fruit and seeds are offered. The amount of food has always been regulated as, like all corvids, they store excess food. From the beginning both males would carry food and feed the female and she would occasionally feed a piece back to them. At times the males have been seen to feed each other. On March 9th, just over a week after they arrived, the paired male was seen carrying a stick which he subsequently gave to the female. A bundle of birch twigs and some dry grass and moss was put into the aviary and on March 12th all three jays started to carry twigs. Two days later the first male was courting the female. He was standing very tall, parallel to the female, with his lower body feathers fluffed downwards. He then bowed and dropped the wing on that side and partially tilted and spread his tail towards her. He was singing continually throughout, the song being a collection of quiet whistles, churring sounds and clicks that could be heard only from very close-by. The second male was never seen courting the female, although he frequently fed her. On March 19th the first male was arranging twigs on the platform on the left of the aviary, and forming the rough outline of the nest. Four days later the pair started to line the nest cup with dry grass. A long piece was selected and taken to a perch where it was bent back on itself many times, the bird using a foot to hold the grass in place, until a bundle was formed that was then taken to the nest. No other material was used and the nest was apparently complete by March 25th. At mid-day March 29th I was fortunate to be present when the pair mated. The female was standing on a high perch, with her tail quivering. The male approached slowly by a circuitous route, hopping from branch to branch and on and off the back of the aviary. The female suddenly spread her wings and held them horizontally, quivering them strongly and the male then mounted her. Afterwards they sat quietly together on the perch. The second male remained at the far end of the aviary throughout this. The female had been sitting on the nest that morning and was sitting again at 3:00pm. She was on the nest throughout the following day and the day after that I found the male sitting beside her on the nest. That day, for the first time, the male began to become aggressive towards me, flying onto the wire when I approached and attempting to peck me, behaviour that became very familiar. Neither the female nor the second male has ever shown any aggression towards me. Both males were now filling their throat pouches and feeding the female on the nest. At this time she was very interested in lumps of cuttlefish 'bone' and broke off pieces and swallowed them. The male also fed pieces to the female. On April 12th I borrowed a small closed-circuit video camera and placed it on the aviary roof just above the nest. Although both males called in alarm, the female remained on the nest throughout. With the camera in position I was later able to watch the breeding male sit in the nest when the female left to bathe and exercise. The use of the camera provided some interesting details I could not possibly have observed otherwise, e.g. by using the camera I realised that the male crouched down in the nest rather than actually sat on the eggs. On the afternoon of April 15th the male was extremely aggressive towards me leading me to wonder if the eggs had hatched. Two days later the female was seen to stand up in the nest and apparently pass food to something beneath her. The second male was seen to fill his throat with mealworms and then take a snail shell and break off pieces, later giving the lot to the female. By April 25th it was obvious that something was wrong, as the female was simply continuing to sit on the nest all day without any extra feeding being observed. The following day a broken egg was found in the bath and when the nest was checked two eggs were present. In contrast to earlier occasions, the female readily left the nest when it was approached. Both these eggs were infertile and the nest was abandoned. The eggs were strikingly beautiful, being pinkish buff, mottled with darker rufous spots and blotches. The egg that was measured was 28.4mm x 22.3mm. Three days later the breeding male was seen giving a stick to the female and later they were seen adding sticks to both of the other nest sites. On May 1st a new nest was under construction at the centre site and for the first time the female was heard singing. On May 6th there was an egg in the new nest and the male was again very aggressive towards me. I moved the camera to above the new nest and the birds were not too disturbed by my doing this. Incubation apparently began the following day and on May 15th I could see there were five eggs in the nest. Six days later I was watching by means of the camera when the male was 'guarding' the nest while the female was off exercising. When the female returned, the male started to vibrate his wings as she approached and the female fed him before settling back onto the eggs. The male then departed. On May 24th I decided to cheek the eggs, as I was afraid that they would again turn out to be infertile. When I entered the aviary the female left the nest and all three birds scolded me from the far end of the aviary, but did not approach me. As the shells were too pigmented to make candling possible 1 floated the eggs in warm water. Three of the five definitely moved, so this time I knew I had a fertile clutch of eggs. One of the other eggs was damaged and was removed. The female returned to the nest as soon as I left the aviary. Using the camera the next morning I was able to see that all four eggs were still present When I next checked at 1:30pm, one chick had hatched. The male kept trying to feed the chick, but was continually intercepted by the female which took the food from him. At 5:00pm I could see that a second chick had hatched and a third egg had split almost in half. The female kept rising in the nest and gently touching the hatching egg and breaking off and swallowing small fragments of shell. At 6:05pm the chick struggled free and the female promptly ate the shell, thus explaining the absence of eggshells in the aviary. The following morning the male was feeding the young without interference from the female. If a chick did not beg spontaneously the parent encouraged it to do so by putting the tip of its bill just beneath the chick's chin, raising its head. This always caused the chick to gape. At this point the male was spending much time sitting on the side of the nest beside the female, which rarely left the nest The male was feeding the chicks soaked dogfood as well as livefood. At this time the adults would not feed mealworms to the young, preferring instead to give them waxmoth larvae. Small pieces torn from pinkie mice were also fed to the young. The youngest chick was missing from the nest on the morning of May 28th, the third day after hatching. At 2:00pm on the same day the female was seen removing the unhatched fourth egg from the nest. This was found to contain a dead, fully-formed chick. It was May 31st when the young were six days old, before I saw the second male bring food to the nest, although he had probably been doing so earlier. The difference between the two males' feeding methods was very noticeable. The breeding male, the father of the young, always tried to feed the young itself, actively attempting to avoid giving the food to the female, whereas the other male showed no interest at all in the young, instead always giving the food to the female, which then passed some of it to the chicks. As everything seemed to be progressing well, I was surprised to discover the younger of the two chicks dead in the nest on the morning of June 4th. Later that day the female removed it from the nest and I was surprised to see how large it was. I believe it simply failed to compete for food with the other chick. It made me aware of one of the disadvantages of using the camera for observation. The size of the image on the monitor had led me to believe that the chicks were smaller than they really were and, as a result, I had failed to provide the amount of extra food that was required. On June 5th feather tracts were visible down the spine of the remaining chick and by June 7th the tips of the flight feathers were also visible. By that time the eyes were definitely open. The female jay was first seen to collect food on June 11th which was the first time that the chick was left unattended for even a brief moment. It was now 18 days old. On one occasion when the female returned to the nest and the chick failed to gape, having in her absence been fed by the male, she resorted to lifting the chick's head, as was the practise when the chicks were newly-hatched. At 3:l5pm on June 14th the young jay climbed out onto the rim of the nest for the first time. It was then three weeks old. The female immediately squatted down in the vacated nest. This allowed me the first good view of the chick, which was basically a greyish-brown colour, with very dull blue wings. The head was still covered with pin-feathers, and some of the flight feathers were still in their sheaths as were all the ½in (13mm) long tail feathers. The beak was flesh-coloured and the legs and feet were grayish-pink. The iris of the eyes was dark. There was the suggestion of a small frontal crest, the pin-feathers there being somewhat longer. The chick had returned to the nest by 4:00pm. The next day the chick was sitting on a branch beside the nest and the following day left the nest area completely, and sat on a branch lower down the aviary. The young bird continued to develop uneventfully and by June 30th was able to fly the length of the aviary. By then its tail was two-thirds adult length. The juvenile was still being fed occasionally on July 15th, even though it had been self-supporting for some time before this. On July 3rd the adult breeding pair started to vigorously chase the second male in an attempt to drive it away. They settled down again a short time later, hut this was the beginning of the expulsion of the second male. The following autumn the persecution got worse and there were times when I found the second male pinned to the ground on its back, with both other adults attacking it. The juvenile took no part in this. Eventually the second male had to be removed from the group. That autumn the young bird completed a body moult, after which it resembled the adults, except that it had a striking vertical frontal crest. The bill remained pale and darkened at the tip only, and the iris of the eyes was still dark. 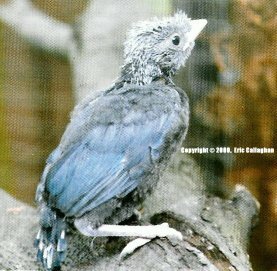 At the time of writing (April, 2000), the young jay is almost two years old, and the crest is now very much reduced, although still more evident than is the case with the adults, the bill is black and the iris of the eyes is brownish. Goodwin, D. 1986. Crows of the World. British Museum (Natural History), London. Madge, S. and Burn, H. 1999. Crows and Jays. Christopher Helm/A. & C. Black, London. Eric Callaghan was recently awarded the Society's medal for the first breeding of the Bearded Barbet Lybius dubius in Great Britain or Ireland (Avicultural Magazine 105,2:49-53). He is attached to the Department of Zoology, University College Dublin, Belfield, Dublin 4, Ireland.